Gov. Cuomo announced Thursday that his state will help restore power in Puerto Rico and also improve access to clean water as the U.S. territory struggles to recover from Hurricane Maria. 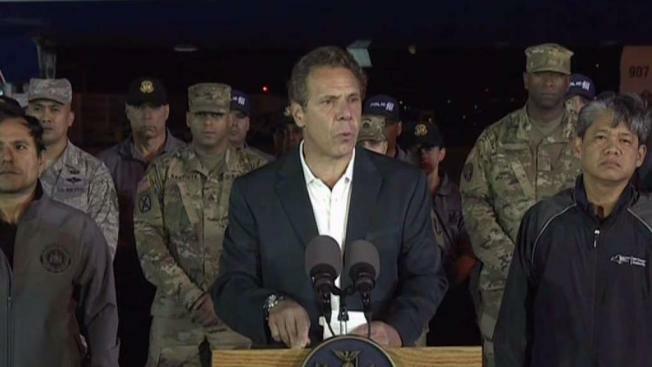 During a one-day visit to the island, Cuomo pledged $1 million through the Empire State Clean Water Fund to buy water filtration systems and said he would deploy a tactical team in November that specializes in the supervision of transmission and distribution system recovery. It is the second time that the New York Democrat has visited Puerto Rico since the storm, and he criticized the federal response. "To be here five weeks later and people still don't have power, people still don't have water, the results speak for themselves," he said. "It's unacceptable. It's inadequate. It's a life-and-death situation." The storm hit Puerto Rico as a Category 4 hurricane Sept. 20 with winds up to 155 mph. It killed 51 people, flattened Puerto Rico's electrical system, decimated thousands of homes and left tens of thousands unemployed, many of whom have left for the U.S. mainland in search of jobs and to enroll their children in school. About 75 percent of the island remains without power. Roughly 20 percent is without water, and officials warn that those who do have water service still need to boil it before drinking it. "There's been a different standard that has subliminally been imposed," Cuomo said. "It would not be acceptable if any of the 50 states went through this ... It would be immediate outrage." Taking aim at comments by President Donald Trump, Cuomo said rebuilding Puerto Rico will take years and billions of dollars of federal funding. Two weeks ago, Trump tweeted: "We cannot keep FEMA, the Military & the First Responders, who have been amazing (under the most difficult circumstances) in P.R. forever!" The governor traveled to the U.S. Virgin Islands and Puerto Rico last month to survey hurricane damage. He noted the approaching fifth anniversary of Superstorm Sandy, which lashed New York City and Long Island. "We rebuilt a New York that is better and stronger than it was before Hurricane Sandy," he said. "That should be the attitude in Puerto Rico." New York already has sent millions of bottles of water, baby wipes, diapers and other goods to Puerto Rico, and it has deployed hundreds of National Guard military police, engineers and soldiers and also volunteer medical staff. Cuomo said he also could send hundreds of power crews to Puerto Rico within days if the island's government activated a mutual aid agreement, which it has not. Instead, Gov. Ricardo Rosello's administration awarded a $300 million contract to a small Montana company called Whitefish that has sparked outrage and led members of Congress from both parties to demand an investigation. The company is located in the hometown of Interior Secretary Ryan Zinke. On Thursday, Rep. Rob Bishop, the Utah Republican who heads the House Natural Resources Committee, sent the director of Puerto Rico's Electric Power Authority a letter demanding documents, including those related to the contract with Whitefish and others that show what authority the agency has to deviate from normal contracting processes. The letter also was signed by Rep. Bruce Westerman, an Arkansas Republican who is chairman of the House subcommittee on oversight and investigations. Rossello said he has asked for an audit on the contract awarded by power company director Ricardo Ramos. "I can't make an assessment right now on how effective they're being," he said of Whitefish workers, adding that he sees them working hard across the island. Rossello also said he will not hesitate to act if any wrongdoing is found: "There will be hell to pay."